I haven't been lost, but I have been busy ...... checking on an ill step-father-in-law, setting up a page on Facebook for communicating with cousins, nursing a sore leg, and knitting ....... among daily chores of course. :-) Heather has claimed the pair of socks that I had been knitting last month that you see in this picture. 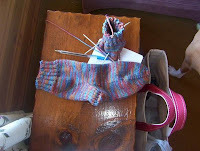 I am now working on another pair for myself and almost ready to start decreasing for the toe on the second sock ....... so should soon have another sock pic for the blog. Wind and rain have been stalled with us for the last days; however, the latest report says sun is on the way. That's a pleasant thought for the immediate future. The scenery is still beautiful this time of year regardless of the weather though, isn't it?! I can't blame Heather for grabbing the socks; they are gorgeous!